On Intamin's hydraulically-launched coasters, the rollback fins pop up in sections after the train passes over them. To a non-automation-engineer, this does not seem to be a fail-safe system, as it relies on the computer to reset the fins to a safe position while the train is in motion. As a software engineer, I'm well aware that computers freeze and programs are subject to bugs. Is there something that I'm missing here? Is there a mechanism in place that will abort the launch if the fins don't activate? If so, wouldn't that rely on the computer as well? Someone with more knowledge can correct me — if the system fails they return to their default position of "up." You are correct. The fins are spring-loaded and held down using electromagnets. Any failure will cause them to reset to their up position. That would handle a catastrophic failure like a power outage, but what if the computer doesn't send an "up" signal? Are they all on timers so they raise independently even if the main PLC hasn't signaled them to raise up again? The PLCs that they use for the rides are very stable in their operation. Far more so than a PC or phone. As far as how the brakes work, they default to up. It would be very unlikely that the brakes would not rise as the train goes past, as the computer has to be functioning for the train to launch. While I haven't worked the ride, I would guess that there is someone in the control booth that checks the brakes and could press the e-stop of necessary. Another thing that likely improves the safety... It appears that each of the fins has its own lifting/ retracting mechanism. If that's the case, then even if a "spring broke" (or anything happened that caused a fin to NOT be there) many other fins would still pop up. I imagine that the train would still stop safely with less then 100% of the fins. If all or most of the springs broke at the same time, there could be a big risk, but the chances of that must be extremely small. I imagine that those springs are checked and replaced often. There may be other redundancies I'm not aware of (extra springs perhaps)? For what it's worth, I have ZERO actual information about this ride. I'm just thinking out loud here. Are you sure? I thought they were spring loaded and used compressed air to hold them down. I imagine the air release valves are held by a solenoid of some kind. If you ever watch a train rollback, you'll note that it stops long before the start of the "launch." The computer has sensors in each fin to know that it goes up and down correctly. If enough of the fins don't work properly (likely just one, but I can't say for sure) the computer will require maintenance to come look at it. You can also take a look at the brake run. There are a lot less of the fins on the brake side than the launch side. That gives a good estimation of how many of the launch side fins would have to fail before a major problem happened. Thanks for the info Og! Looking forward to getting my first ride on TTD in a couple of weeks. I'll take a close look at the mechanics as you've suggested. TTD is really an amazing piece of hardware. I complain about coaster downtime as much as anyone, but sounds like of that downtime helps ensure our safety. A few observations / theories I came up with. This is based mostly on knowledge of the complex heavy machines that I work with. While quite different, they are very similar at the same time in a lot of ways. As far as the rollback brakes, TTD (CP is my home park) has somewhere around 10 individual sections of brakes that pop up one at a time after the train launches past them. So failure of a lot of them is probably still in the safe range. Assuming that the brakes are spring loaded to fail in the UP position, there are still things that can go wrong. Sensors have to register when a train passes in order to know to pop up. I'm going to guess that each of the 10 (ish) brake systems has it's own set of sensors and computers. They would be wired completely independent of each other. That way failure or even a malicious virus in one will have no effect on the others. There are most likely a few different power grids to the brake computers as well, that way one "blown fuse" will not affect all systems. I wouldn't be surprised to learn that in addition to power from the grid, there is an independent generator of some kind (gasoline powered or a giant storage battery) that runs in constant parallel and will take over instantly in a complete power outage. Another strong possibility is that these computers are probably at least 2x redundant. Meaning that each computer runs 2 channels at the same time. One is controlling the system, while the other is running in the background and will take over instantly if the other channel fails. And if there are 2 computers to each system, which is likely, you now have 4x redundancy in every one of the 10 (ish) brake systems. This leads to so much redundancy in the ride that the probability of a rollback accident is near nothing. But then again, this is Intamin. Now that I have had a little more time to think about this, I did remember something else. Now, I haven't worked Dragster, and I have only dabbled in PLCs, but I would bet that there is a feature used called a "watchdog timer". I know that watchdog timers are used extensively in the micro controller world, and I would suspect that the all the PLC controlled rides at Cedar Point use them. A watchdog timer is a timer that is continuously counting up. The timer can never be disabled. All the program can do is reset the timer, thus the program in the PLC will periodically reset the timer. If the timer ever counts too high, the system will know that there is a problem with the computer, and can respond appropriately e.g. switch to a redundant computer long enough to get the trains to a safe position, or activate an emergency shutdown. One of the things that happens when an emergency shutdown is activated is that all the compressed air is drained from the system. This will cause all the brakes to "close," or in the case of Dragster, go up, ensuring the trains come to a stop (or a very very slow speed if Dragster isn't near a drive tire). I honestly trust the magnetic fins more than the fin/pinch brakes found on an older Premier LIM coasters. But I imagine both are equally safe. The only accident of this kind that I've heard of was Pony Express at Knotts, which once had some sort of brake failure after a rollback leading to a collision. I hope they rectified the issue, and I feel like we're lucky that it didn't happen on a faster coaster (that said, I imagine not ALL the brakes failed and it wasn't rolling back at full speed.) Pony Express uses a catch car launch (kind of like a hydraulic launch but powered by a flywheel instead of hydraulic motors) and fin/pinch brakes for rollbacks. The Knotts collision was caused by painted brakes, believe it or not. The train slid right through the otherwise functional safety system. ^That actually makes me feel better. It would have been extremely worrying for the system to fail so dramatically due to simple mechanical failure. Looking at the brake mechanism, it is pretty obvious they use pneumatics to hold the fins down and springs to raise them up. Each cylinder has an air hose and the sounds it makes indicate that they use compressed air. Why on earth would Knott's paint brake fins, anyway? So they'd look prettier? And why, if there's a safety mechanism in place, would they not have tested it even once, let alone daily? I wonder if they only tested it empty after the paint job. Surprised this wasn't referenced. If it already was, forgive me. By now, magnetic braking systems have been around a long time. The earliest one I am aware of on a major amusement ride was on Kentucky Kingdom's Hellevator in 1996, the first of the Intamin second-generation free-fall towers. The technology moved to roller coasters in 1999, with Superman: Ride of Steel at Darien Lake and the Funtastic Shows Wildcat at the Western Washington Fairgrounds, and of course the following year, it was employed on Cedar Point's Millennium Force. 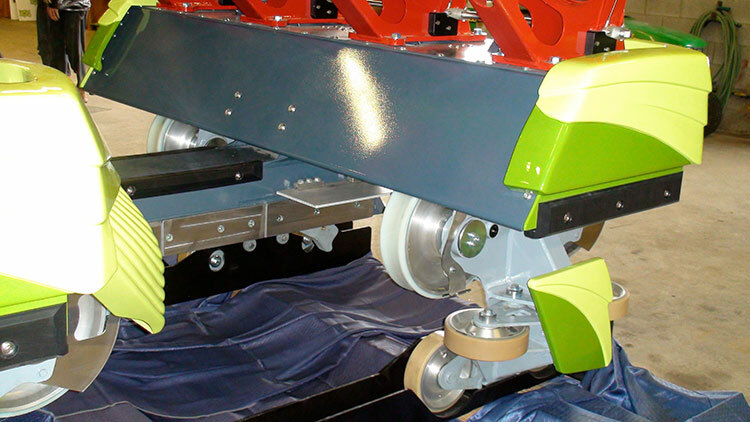 Since then, magnetic brakes have been used at Cedar Point on Wicked Twister, Top Thrill Dragster, Maverick, GateKeeper, Snake River Falls, and even on Rougarou. All of these systems employ rare-earth permanent magnets and braking fins which are electrically conductive, but non-ferrous and therefore not attracted to magnets. These fins are usually made of alloys made mostly of aluminum or copper. The principle is simple enough: if you pass a conductor through a magnetic field, an electric current is generated in the conductor. That current creates its own magnetic field which interacts with the original field, and ultimately has the effect of resisting the motion of the conductor through the field. In other words, you get a braking action. It's especially attractive for use on roller coasters and other amusement rides because the amount of braking force is proportional to the difference in velocity between the magnetic field and the conductor. So rapid motion creates a high braking force, which diminishes to zero when the motion stops. This means that while the magnetic brakes can bring a vehicle to a near-stop, they cannot be used to hold the vehicle in place. Most rides that use magnetic brakes also use advancing drive systems, and these can be used to stop the vehicles. In practice, it doesn't really matter whether the magnets or the braking fin are on the vehicle. 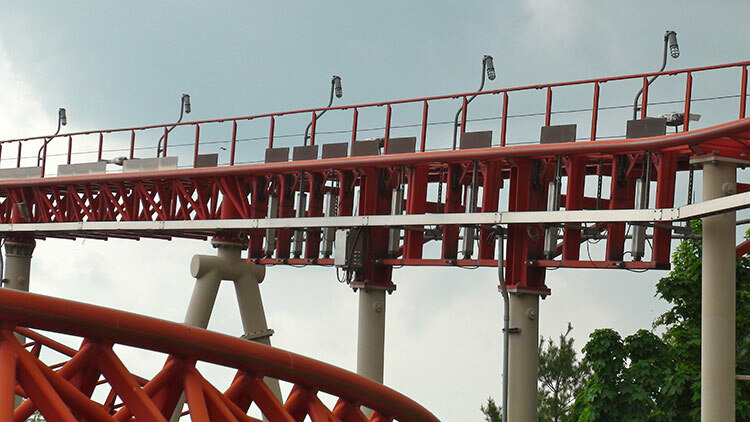 On Millennium Force and Rougarou (and Kings Island's Banshee, since you mentioned it), which have relatively few braking magnets, it makes sense to put the magnets on the track and just put an aluminum or copper fin on the train. Top Thrill Dragster, on the other hand, has so many braking points because of the launch track, plus the brakes need to be moved very rapidly for the safety system to work properly, so it makes more sense to put the magnets on the train, and put the braking fins on the track. All of these systems make use of rare-earth permanent magnets. Where things get really interesting is on Wicked Twister and Maverick. These rides use linear motors to propel the train. In the case of Wicked Twister, the train is propelled by a series of linear induction motors (LIMs). In this case the principle is exactly the same as for the magnetic brakes, except that instead of permanent magnets, the ride uses a series of three-phase electromagnetic coils. By generating a moving magnetic field, the coils induce movement in the reaction plates on the train, causing the train to move. In the case of Wicked Twister, the LIMs are used only to move the train forward or backward. 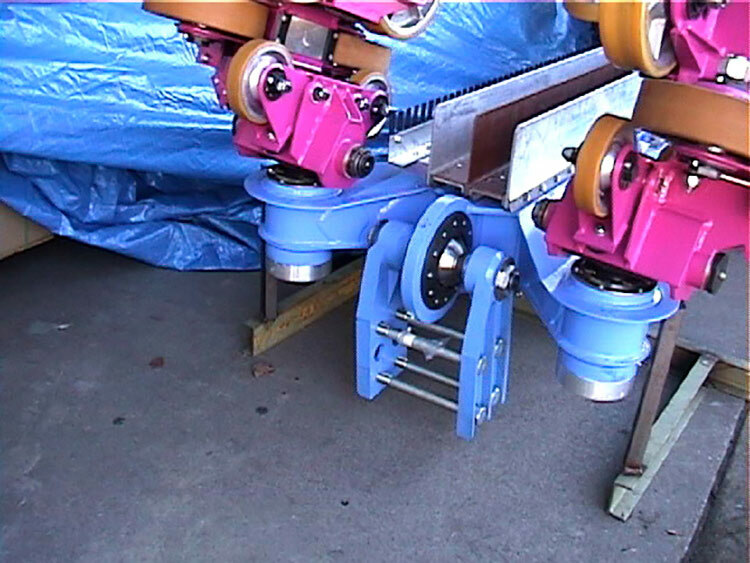 A set of magnetic brake calipers (permanent magnets mounted on a sliding carriage) drops down over the outer fins on the train to provide braking exactly as on Millennium Force during the last backward pass through the motors. Then the LIMs are used to precisely drive the train into the station and park it for unloading. Maverick introduces another technology. Like Wicked Twister, Maverick is propelled by linear electric motors. Unlike Wicked Twister, Maverick uses linear synchronous motors (LSMs). The difference between the LIM and the LSM is that while the LIM induces a magnetic field in the reaction plate and pushes that field, the LSM interacts with the field of a permanent magnet in place of the reaction plate. So the Maverick trains have magnets bolted to the bottom on either side of a channel. With careful timing, the electromagnet coils on the track interact with the magnets on the Maverick train to push the train up the lift hill, and to launch it to high speed in the launch tunnel. Conveniently, the very same magnets on the train can be used in conjunction with copper and aluminum braking fins, just as on Top Thrill Dragster, to slow the train when needed. Maverick has an added bonus. The electromagnet coils are really nothing more than a three-phase coil of wire connected to an AC power supply. When the power is shut off, that's just a short-circuit coil, electrically very similar to a plain metal reaction plate. In other words, when the power is lost, all of those LSM coil packs (motors) on the lift hill and in the launch tunnel effectively become brake fins. This is why Maverick requires no anti-rollback devices on the lift hill. If power is lost, the train's speed will be limited as it rolls back down the hill to the staging point at the base of the lift. There, the advancing drive will drag the train to a full stop. 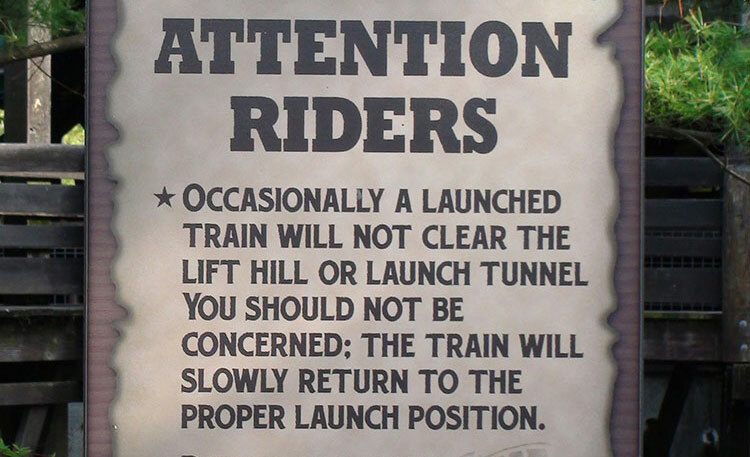 Likewise, the launch in the tunnel is uphill, so if the power fails, gravity will drag the train back to the base of the launch, its speed limited by the braking action of the motor coils. That won't necessarily bring the train to a stop, but it will come close. On Maverick, each block brake location uses, instead of a brake, a set of drive wheels. A pneumatic rubber tire is attached to a reducing gear assembly and connected to a variable-frequency (for our purposes meaning its speed can be precisely controlled) electric motor. Of course, the electric motor won't operate if power is lost, but the way the reducing gears are built, it won't turn either. Any trains that are out rolling around when the power fails will be slowed as usual by the magnetic brake assemblies, then will come to a stop on the first of the feed tires. There is no danger of a collision in this case because standard blocking rules dictate that a train may not be allowed into a block until the stopping position at the end of the block is clear. On Maverick, the blocking rules are modified a little because a launched train may have to stop at either end of a block. 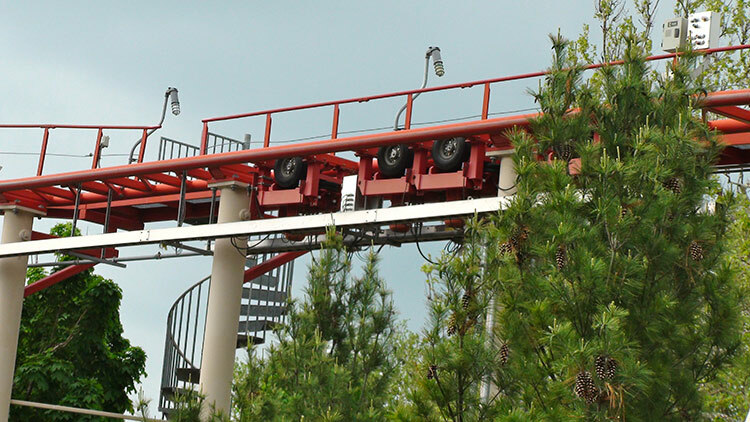 For this reason, the second train on Maverick may not move up to the advancing tires at the base of the lift until the first train has cleared the top of the lift. Electric Voodoo: It's Done with Magnets! First Drop — Dave Althoff, Jr. If you ever watch a train rollback, you'll note that it stops long before the start of the "launch." I've never seen a rollback in person, but this Youtube video confirms your comment. Looks like at least 15 pairs of "backup" fins after the train stops. I love everything about this post. I dont even have anything to add. They've covered it all already! Nice to know I'm not surrounded by idiots on these boards.